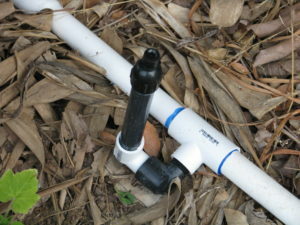 One-inch PVC runs from the valve. This is the last of the series of posts on irrigation, and I’d like to briefly address the issues of water pressure and valves. As I’ve said in a past post, if you don’t know about these things then hire someone who is an irrigation specialist (not just someone who says he’s put together irrigation before… they are guessing!). 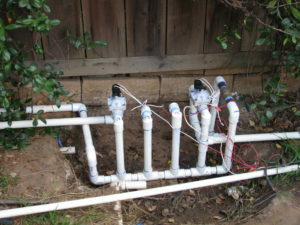 That specialist will obtain for you the right sized valves, the right irrigation timer, and monitor the water pressure so that your sprinkler heads won’t blow off and pipes break. The one-inch pipe is then reduced to 3/4″ pipe at the first T, close to the first sprayer. For pipe, don’t use small 1/2″ pipe for large jobs. Bigger – to a point- is better. Smaller pipe doesn’t mean higher pressure. It reduces the volume of water going to the sprinklers. 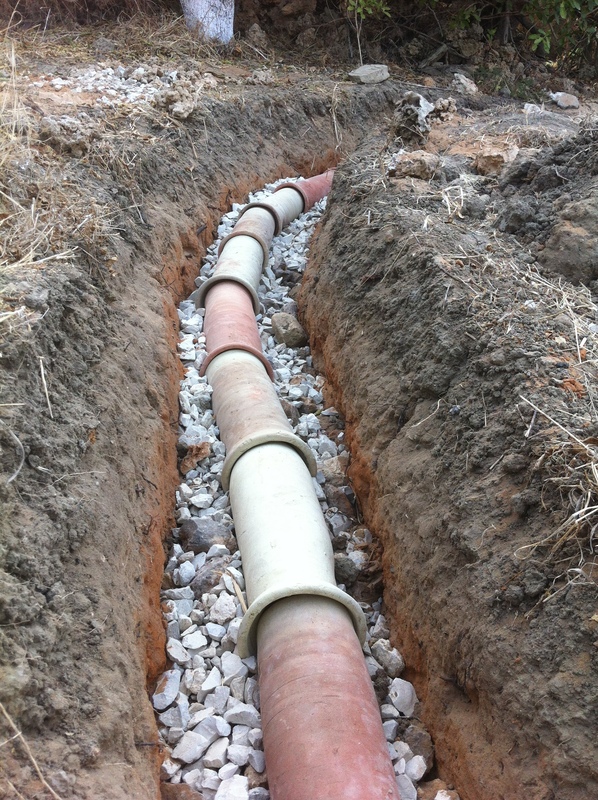 The smaller pipe creates more pressure loss due to friction and turbulence as the water flows through it. We took the advice of our irrigation specialist and ran 1″ pipe from the valves to the first sprinkler, and reduced it to 3/4″ pipe, then reduced for the 1/2″ risers. 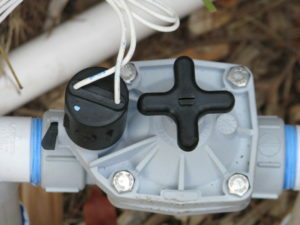 Further reducing 3/4″ to the 1/2″ sprinkler configuration. Most sprinkler systems need a water pressure of between 30 – 50 psi. Drip systems need less, around 20 psi. Too high or too low a water pressure will adversely affect your system. If you attach a water pressure gauge to a spigot you can see what your pressure is. If it is very high, you will want to check the indoor pressure as well because too high a pressure can mean pipe damage and leaks, and no one wants wet walls. 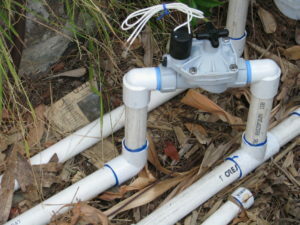 You can use a pressure regulator on your line to reduce the water pressure for your irrigation. How many sprinklers you can put on a valve depends upon several factors, but mainly the flow rate, or how much water is flowing through the pipes at one time. Sprinklers have an output rate so you can do the calculations on how many you can put on a line. Flow rates are measured either in gallons per hour or gallons per minute, with gpm the most common for householders. Drip systems are less concerned with flow rate. We ended up adding valves to our system because we had so many sprinklers. When installing your system, be sure to add a ball valve (rather than a cheap gate valve) close to your water source so that if you have to work on your system you can shut it off; otherwise you’ll have to shut off the main to your outside water. If you have a large system, installing ball valves along the line to isolate different areas will help down the road if you need to troubleshoot. Having hose bibs along the line are very nice, too. There is a lot to learn about irrigation valves – using globe valves with an expensive back-flow preventer or using anti-siphon valves that must be above ground and above the closest sprinkler head. I’m not an expert, but there is expert advice on valves here. Another thing to consider is your electrical line. If you have valves, you must run electrical line to them (at this writing, solar valves are not that dependable for the long run). Electrical line must also run from your irrigation clock to your electrical source at your house. Usually electrical line is buried. Please spend the little extra money and have the electrical pulled through conduit first, rather than direct burial! Having loose wires buried in your yard is a recipe for disaster. I know this. I asked for conduit with the original system, and the wire was directly buried before I could protest. Sure enough, two years in and a valve wouldn’t turn on. The problem was with the wire… but where? How to dig it all up without nicking any of the lines? Impossible. So until this project two of my valves had to be tied together and both stations running simultaneously, which really stunted the water pressure and was a real headache. This time the conduit is run above ground along with the PVC pipe, which will be covered with mulch, and also along the top of my chain-link fence up to my house. If there are any problems, the conduit comes apart every ten feet and wires can be checked or replaced. Pulling electrical wire through conduit is not for the fainthearted; I developed new muscles and callouses working on that, but it was worth it. Skipping ahead, your irrigation project is finished and your landscape planted. Be sure to take the time to update your plan so that it is an ‘as-built’, reflecting any changes you’ve made. This is an invaluable document not only for your own use, but for any future owners of your property or workers who might need that information. Use a rough plan of your yard and identify each valve and the area the valve covers in different colors. If you want to draw in every sprinkler head, that is fine. On large projects that isn’t practical, so just use zones. Take a waterproof marker and write the valve numbers on the valves themselves, so that you won’t become confused in the field. Be sure to run each valve during the daytime while you inspect the sprinklers for clogging or broken heads. A lot can go wrong during the night when most systems run, and you won’t know it until you get the water bill or your plants start to die. You may want to put in the wire for additional valves that may be added in the future. Making double valve stub-outs and only using one is far easier than pulling new electrical if you find that you need to add a valve. So don’t think that irrigation is a simple endeavor, and begin to glue miles of 1/2″ pipe together with 2 – 3′ risers that shoot water up embankments. This is a waste of money, plastic, water and plants. Put as much thought into your system as you put into the design of plants, and your system will give you little trouble in years to come. Oh, and remember to shut your system off when it rains! You can read Options, Part 1 of this series here, Part 2 Evaluating Your System here, and Designing Your System Part 3 here . This tubing is so easily nicked that weeding around it often results in a bad leak that isn’t detected for awhile. 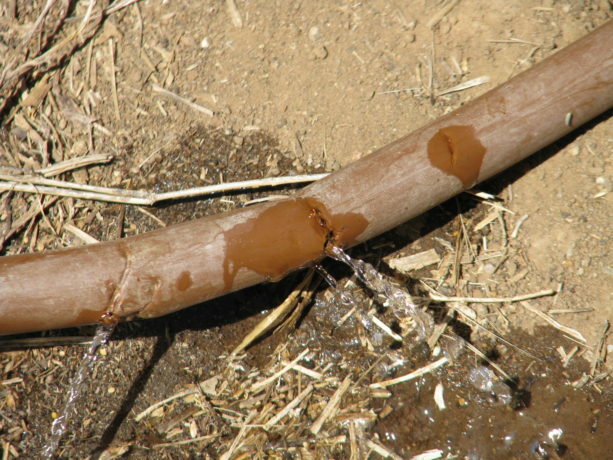 Leaks cause flooding with dry areas past them on the line. A previous draft of this post was about 2,000 words of mostly rant against Netafim, so I’m starting over trying to be more helpful. You’re welcome. In Southern California, and many dryland areas, if you are to grow food crops you have to irrigate. I have met several people who believe that they can ‘dry farm’ crops such as grapes here, and that is problematic. Even in Central California where they receive many inches more rain than we do, farmers struggle in the long hot, dry summers. There are many ways to water, and I’ll address as many as I can. The first and most important step for irrigating your property is installing the earthworks that will harvest what rain we do receive and allow it to percolate into the soil. Paring that with burying wood and other organic material to hold that water, planting in shallow depressions rather than on raised mounds and sheet mulching will greatly increase the health of your plants and decrease your water bill. Ollas (oy-ahs) should have a lid or stone or something to block the top, to keep creatures from falling in and drowning. Photo from link page. For small yards, or for orchards with lots of labor, burying ollas (porous clay pots) in the center of a planting area is a wonderful idea. There is a really good article with diagrams and suggestions here. You can manually fill the ollas by carrying water to them (the best would be from rain barrels), or dragging a hose around to fill them. Or they can be combined with a water delivery system of pipes as discussed below. Water is then drawn through the porous pots by the dry soil around them, and thus to plant roots. There is a tutorial about making inexpensive ollas from small clay pots, and interesting comments, here. There are problems, but then, there are problems with everything. Clay pots can break, especially if you have soil that freezes or foot traffic. A larger pot doesn’t mean that water will be delivered farther underground; absorption is based on soil density. This is a system that you need to monitor and replace periodically. On the plus side, clay is natural and will decompose in the soil. Many years ago, long before I ‘discovered’ permaculture, I buried gallon milk jugs in which I punched small holes by some trees beyond any irrigation pipes. I didn’t know about ollas then; I just thought it was a good idea to get water close to the roots of the plants. This really worked and those trees are mature and still exist almost thirty years later, and still don’t have irrigation to them. However, I found that the plastic milk jugs become brittle and break apart, as will plastic soda bottles, and you really don’t want to bury plastic. Clay is much better. Clay pipe photo from Permanomades. Please follow link to website. These look very large, but are not. Next would be delivering water via some kind of pipe. Clay pipes are the most natural, but unless you have the clay, the labor and the time to create lots of long, hollow clay pipes, this is a pricey option. Clay pipes break easily, too. Split bamboo delivers water downhill. Photo from link page. If you have lots of bamboo you can season it, split it, remove the nodes (partitions) and then mount it to deliver water to individual plants, to ollas, or to swales. Again, you need time, bamboo, labor and some expertise. There is a good article about it here. 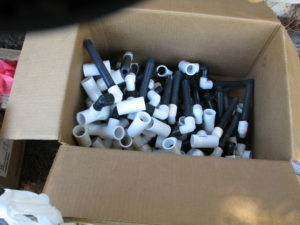 There are a lot of plastic pipes out there, and although I hate to invest in more plastic, it is often a necessary evil. Drip irrigation comes in many forms. 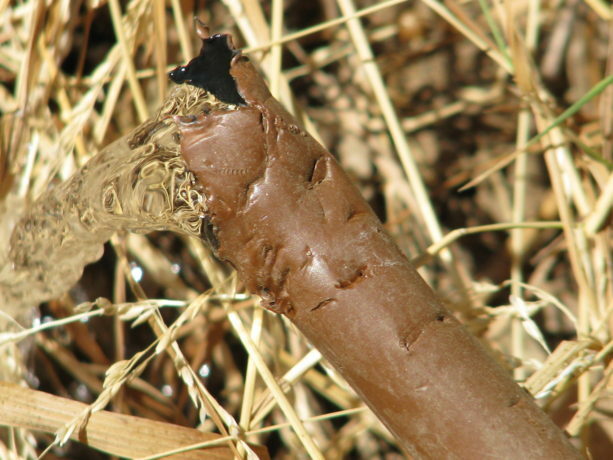 There are bendable tubes that ooze, tubes that have holes spaced usually 12″ or 24″, tubes that can be punctured and into which spray heads are inserted, and tubes which can support spaghetti strands that are staked out next to individual plants. The popularity of drip irrigation has been huge in water-saving communities. Unfortunately they have lots of problems. Here I’ll indulge in just a little rant, but only as an illustration. One of the big problems with flexible tubing in arid areas is the high mineral content of the water and what it does to these tubes. Any holes -including those in small spray heads- will become clogged with minerals. A nozzle that is clogged next to a hole that is not. Flushing the system with vinegar works for a short time, but eventually the minerals win. If the tubing is buried, then it is virtually impossible to discover the blocked holes until plants begin to die. Tubing above ground becomes scorched in the sun and breaks down. Also, flexible tubing is extremely chewy and fun with a little drink treat as a reward. Coyotes and many other animals find flexible pipe so fun to chew. This is the opinion of gophers (who will chew them up below ground and you won’t know unless you find a flood or… you guessed it… dying plants), coyotes (who will dig the lines up even if there is an easier water source, because tubing is fun in the mouth), rats (because they are rats), and many other creatures. Eventually a buried flexible system will be overgrown by plant roots, will kink, will clog, will nick (and some products such as Netafim seem to nick if you even wave a trowel near it), and will be chewed. Some plants will be flooded; others will dry up. 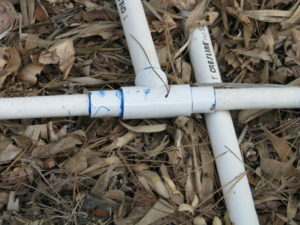 You will have an unending treasure hunt of finding buried tubing and trying to fix it, or sticking a knife point into the emitter holes to open them up and then having too much water spray out. 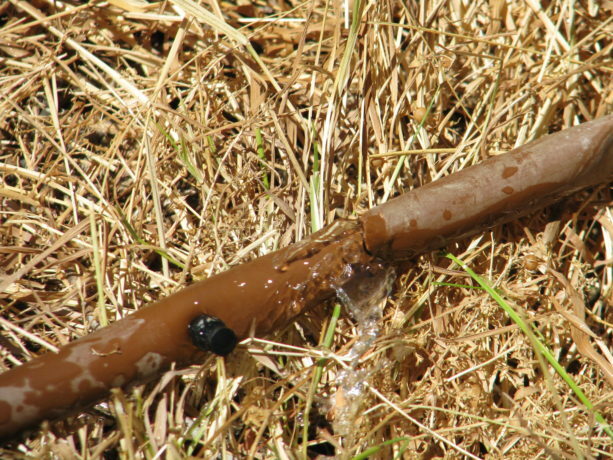 Plus, drip irrigation is not good for most landscape plants. Most woody perennials love a good deep drink down by their roots, and then let go dry for a varying time depending upon the species, weather and soil type. 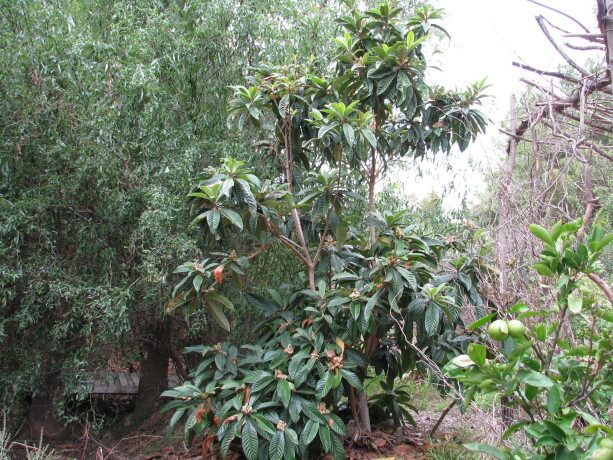 Most native California plants hate drip irrigation. According to Greg Rubin, co-author along with Lucy Warren of The California Native Landscape (Timber Press; March 5, 2013) and a San Diego native landscaper, native plants here enjoy an overhead spray such as what a rain storm would deliver. Some natives such as Flannel Bush (Fremontia) die with summer irrigation and are especially intolerant of drip. 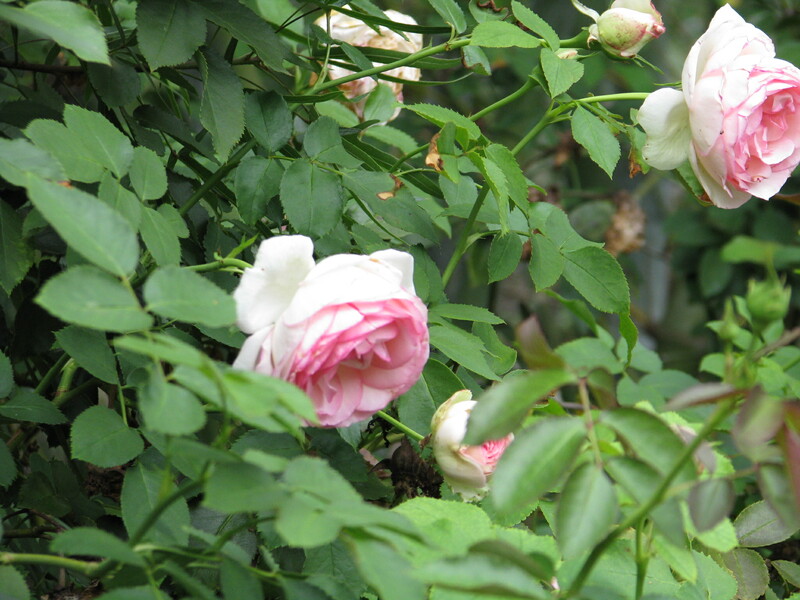 Drip is most appropriate with annuals or perennials that have very small root bases and that require regular watering. 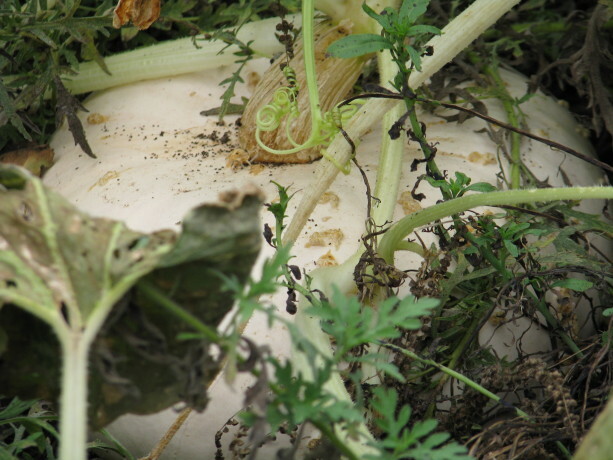 Small root balls are closer to the hot surface and will dry up more quickly. 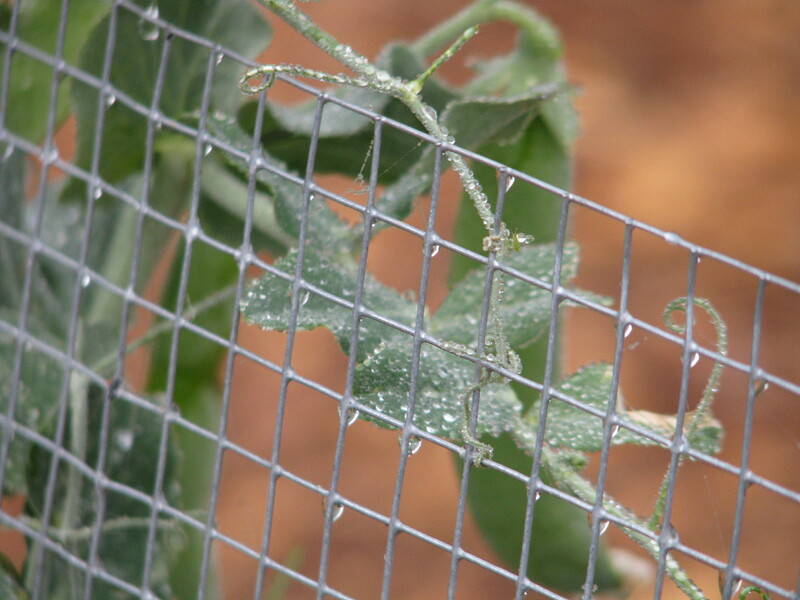 Vegetables, most herbs and bedding plants can use drip. Plants that have fuzzy leaves that can easily catch an air-born fungal disease such as powdery mildew are better watered close to the ground rather than with an overhead spray of chlorinated water. 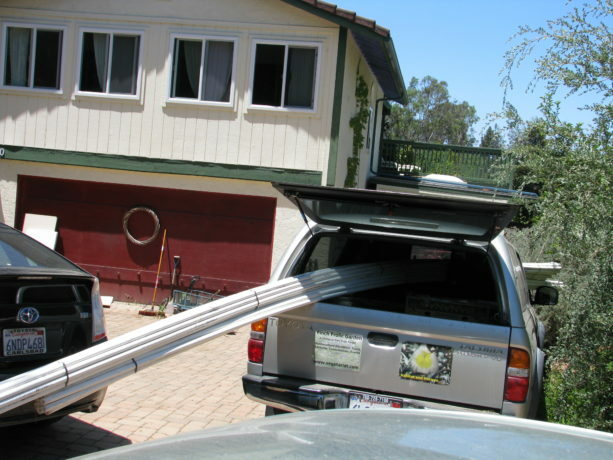 Then there is PVC, the hard, barely flexible pipe that is ubiquitous in landscaping for decades. PVC is hard to chew, can be buried or left on the surface if covered with mulch (to protect from UV rays), is available in a UV protected version if you want to spend the extra money and still give it some sun protection, utilizes risers with larger diameter water deliver systems such as spray heads, bubblers, and even drip conversion emitters that have multiple black spaghetti strands emerging from them like some odd spider. 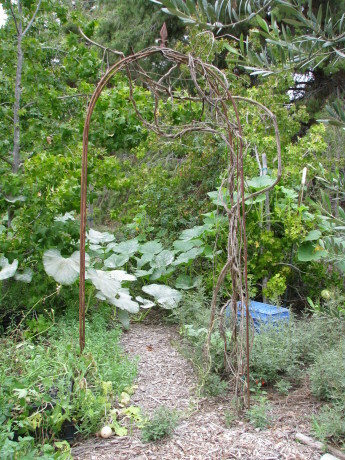 At Finch Frolic Garden I had taken advice to install Netafim, a brown flexible tubing with perforations set 12″ apart, which was buried across the property from each valve box. It has been a living nightmare for most of that time. Besides all the reasons that it could fail (it did all of them) listed above, it also at its best delivered the same amount of water to all of the plants no matter what their water needs. It was looped around most trees so that the trees would receive more water, but since then roots have engulfed the tubing, cutting off the water flow. There are areas with mysterious flooding where we can’t trace the source without killing many mature plants. Over the past year we’ve lost about 1/4 of our plants including most of our vegetables, because we plant where there should be water, and then mysteriously, there isn’t any. Flushing with vinegar helped a little, but whatever holes are still functioning are closing up with mineral deposits. Okay, I’m ranting too much here. But this was an expensive investment, and an investment in plastic, that has stressed me and my garden. So upon weighing all my alternatives I’ve decided to install above-ground PVC with heads on risers that either spray or dribble, and the dribblers will go into fishscale swales above plants. Twenty-foot lengths of PVC can fit in the Frolicmobile, and sure beats carrying it down the property. In the next few posts in this series I will talk about how to draw up an irrigation plan, installation, valves and other watering options, as Miranda and I spend our very hot summer days crawling through rose bushes and around trees gluing, cutting, blowing out and adjusting irrigation. Thanks for letting me vent. You can read Part 2 Evaluating Your System here, Designing Your System Part 3 here , and Part 4 Conclusion here. The many layers of a food forest, Finch Frolic Garden. 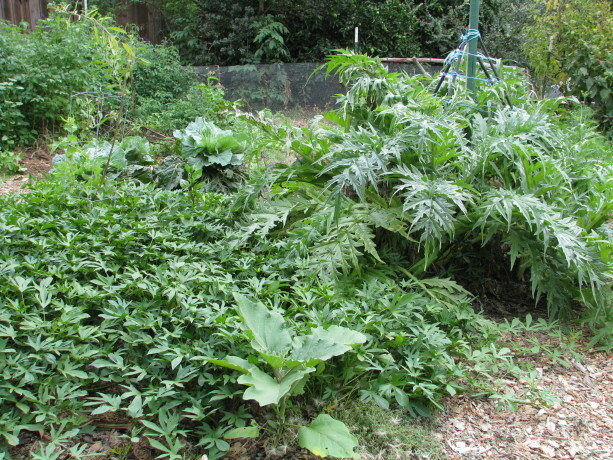 Yours doesn’t have to be this rampant and wild; your plant guilds can look perfectly proportioned and decorative and still be permaculture. 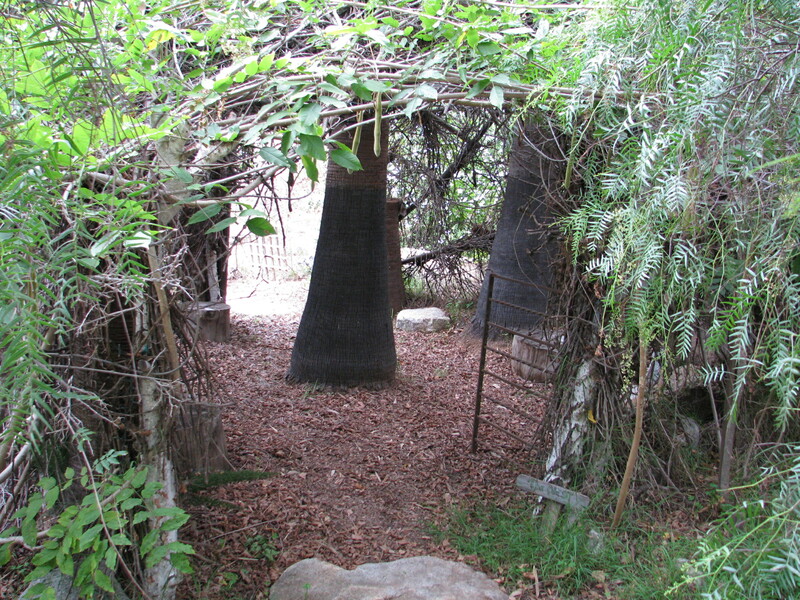 The next part of this scintillating series of What Is A Plant Guild focuses on sub-canopy, or the understory. Sub-canopy does many of the same things that upper canopy does, in a more intensive way. 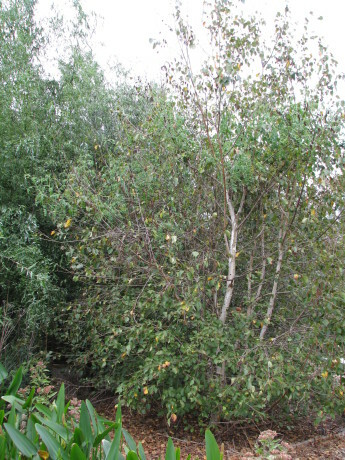 Smaller trees are ‘nurseried’ in with the help of faster-growing canopy trees; in other words, the upper canopy helps shade and protect the sub-canopy from scorching sun, high winds, pounding hard rain and hail, etc. However, sub-canopy trees can also be made of the slower, longer-lived canopy trees that will eventually dominate the plant guild/forest. I’ve talked about how, if an area of forest was wiped clear and roped off, in a hundred years the beginnings of a hardwood forest will have begun. This is due to succession plants making the soil ready for the next. Each plant has a purpose. This phrase is an essential mantra in permaculture because it lets you understand what the plants are doing and then you can let them do it. 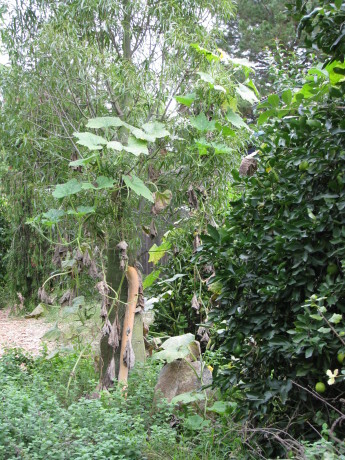 So if you planted a fast-growing soft wood canopy tree, maybe even one that is a nitrogen-fixer, such as ice cream bean, or acacia, with a sub-canopy trees that include both something that is going to stay relatively small such as a semi-dwarf fruit tree, along with a slower growing, hardwood tree such as an oak which will eventually become the true canopy tree years down the line, then the original softwood tree would eventually be sacrificed and used as mulch and hugelkultur after the hardwood tree had gained enough height. Wow, that was a long sentence. At first that hardwood tree would be part of the sub-canopy until it grows up. Meanwhile there are other true sub-canopy trees that stay in that height zone for their life. What makes up a plant guild. Remember, too, that plant guilds are relative in size. If you have a small backyard you may not have room for a tall canopy tree, especially if it is detrimental to the rest of the property. So scale the whole guild down. Canopy for you could be a dwarf fruit tree, and sub-canopy could be blueberry bushes. In a vegetable setting the canopy could be corn or Jerusalem artichokes, where you either leave the dead canes up overwinter (a great idea to help the birds), or chop and drop them to protect the soil, which mimics the heavy leaf drop from a deciduous tree. The plant guild template is the same; the dimensions change with your needs and circumstance. So sub-canopy buffers sunlight coming in from an angle. It receives rain from the upper canopy further slowing it down and shattering the droplets so that it doesn’t pound the earth. 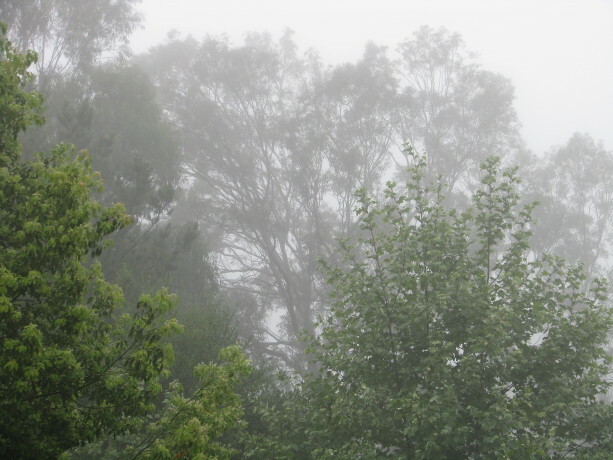 The lower branches also help catch more fog, allowing it to precipitate and drip down as irrigation. Leaves act as drip irrigation, gathering ambient moisture, condensing it, helping clean it, and dripping it down around the ‘drip line’ of the trees, just where the tree needs it. An oak working a temp job as sub-canopy until it grows into canopy, being a support for climbing roses and nitrogen-fixing wisteria. 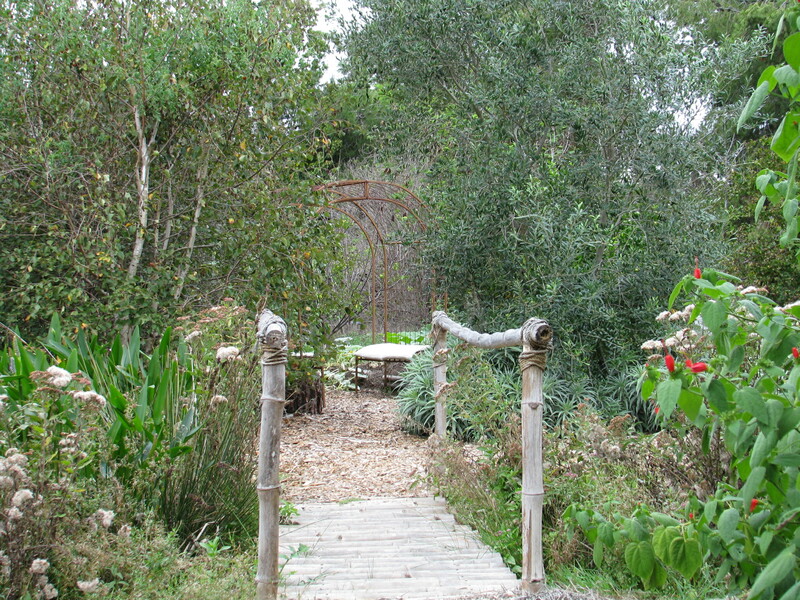 This is the formal entrance to Finch Frolic Garden. 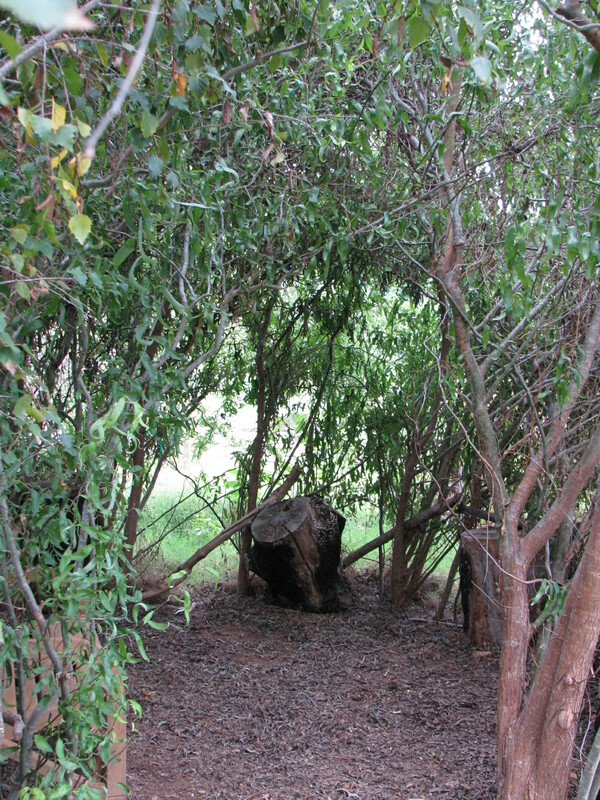 With its sheltering canopy it holds humidity closer to the ground. In the previous post I talked about the importance of humidity in dry climates for keeping pollen hydrated and viable. It further helps calm and cool winds, and buffers frost and snow damage. Sub-canopy gives a wide variety of animals the conditions for habitat: food, water, shelter and a place to breed. While the larger birds, mostly raptors, occupy the upper canopy, the mid-sized birds occupy the sub-canopy. Depending upon where you live, a whole host of other animals live here too: monkeys, big snakes, leopards, a whole host of butterflies and other insects using the leaves as food and to form chrysalis, tree squirrels, etc. 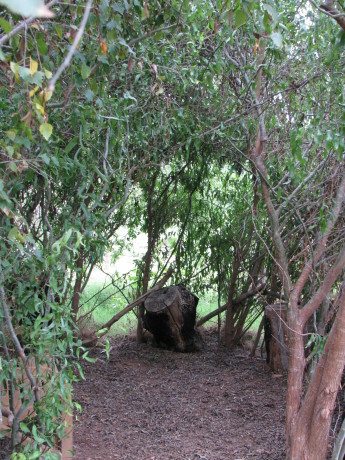 Although many of these also can use canopy, it is the sub-canopy that provides better shelter, better materials for nesting, and most of the food supply. And again, the more animals, the more organic materials (poop, fur, feathers, dinner remains) will fall to fertilize the soil. 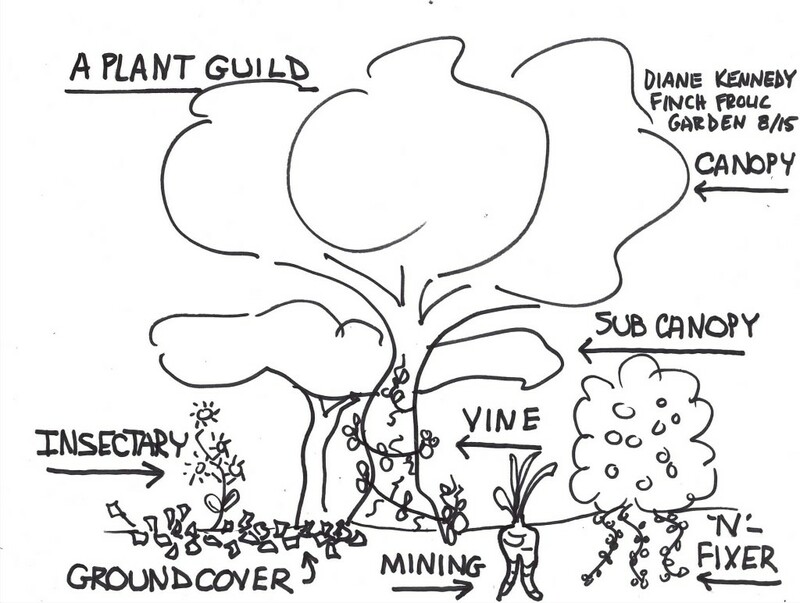 Sub-canopy gives us humans a lot of food as well, for in a backyard plant guild this can be the smaller fruit trees and bushes. Sub-canopy also provides more vertical space for vines to grow. More vines mean more food supply that is off the ground. 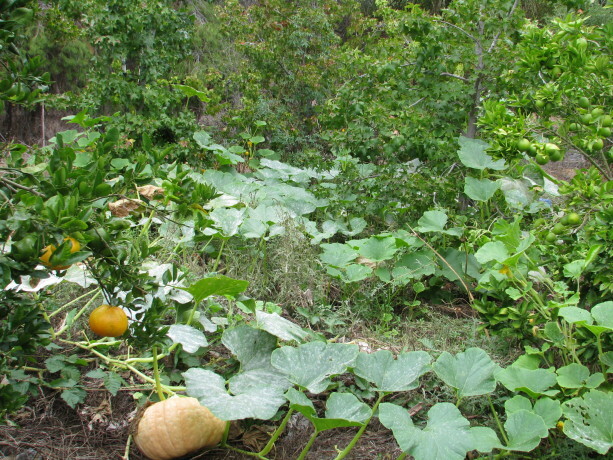 A famous example of companion planting is the ‘three sisters’ Native American method… what tribe and where I’m not sure of… where corn is planted with climbing beans and vining squash. The corn, as mentioned before, is the canopy, the beans use the corn as vertical space while also fixing nitrogen in the soil (we’ll discuss nitrogen fixers in another post), and the squash is a groundcover (also will be covered in another post). There is more to the three sisters than you think. Raccoons can take down a corn crop in a night; however, they don’t like to walk where they can’t see the ground, i.e. heavy vines, so the squash acts as a raccoon deterrent. 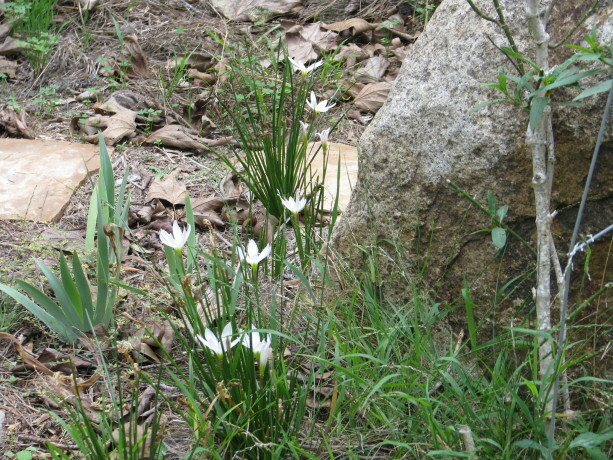 To stray even further off-topic, there is also a fourth sister which isn’t talked about much, and that is a plant that will attract insects. Back to sub-canopy, while some of it can be long term food production trees or plants, it too can also have shorter chop-and-drop trees. Chop-and-drop is a rather violent term given to the process of growing your own fertilizer. Most of these trees and plants are also nitrogen fixers. 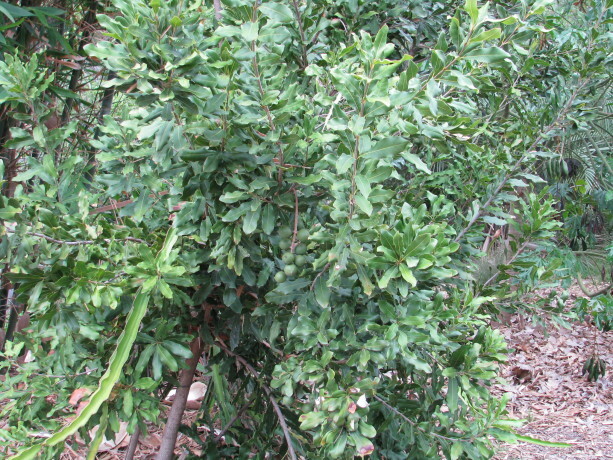 These fast-growing plants are regularly cut, and here is where the difference between pruning and chopping comes to bear, because you aren’t shaping and coddling these trees with pruning, you are quickly harvesting their soft branches and leaves to drop on the ground around your plant guild as mulch and long term fertilizer. If these trees are also nitrogen fixers, then when you severely prune them the nitrogen nodules on the roots will be released in the soil as those roots die; the tree will adjust the extent of its roots to the size of its canopy because with less canopy it cannot provide enough nutrients for that many roots, and it doesn’t need that many roots to provide food for a smaller canopy. Wow, another huge sentence. In this system you are growing your own fertilizer, which is quickly harvested maybe only a couple of times a year. Chemical-free. So, by planting sub-canopy that is long term food producing trees such as apricots or apples, along with smaller trees and shrubs that are also sub-canopy but are sacrificial to be used as fertilizer such as senna or acacia or whatever grows well in your region, you have the most active and productive part of your plant guild. Sub-canopy, therefore, provides shelter for hardwoods, provides a lot of food for humans as well as habitat for so many animals, it provides fertilizer both because of its natural leaf drop and because of those same animals living in it, but also as materials for chopping and dropping, it buffers sun, wind and rain, holds humidity, offers vertical space for food producing vines which will then be in reach for easier harvesting, and much more that I haven’t even observed yet but maybe you already have. The next part of the series will focus on nitrogen-fixers! Stay tuned. You can find the entire 9-part Plant Guild series here: Plant Guilds: What are they and how do they work? The first in a series. , Plant Guild #2: Canopy , Plant Guild #4: Nitrogen-Fixers, Plant Guild #5: Mining Plants, Plant Guild #6: Groundcovers, Plant Guild #7: Vines, Plant Guild #8: Insectiaries, Plant Guild #9: The Whole Picture. 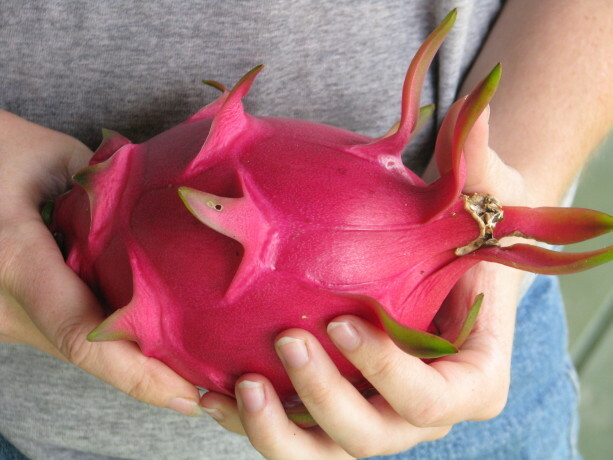 A huge dragonfruit; this kind is white inside. October is one of my favorite months, even when we’re on fire here in Southern California. This year we’ve been saved, and October is moderate in temperature and lovely. 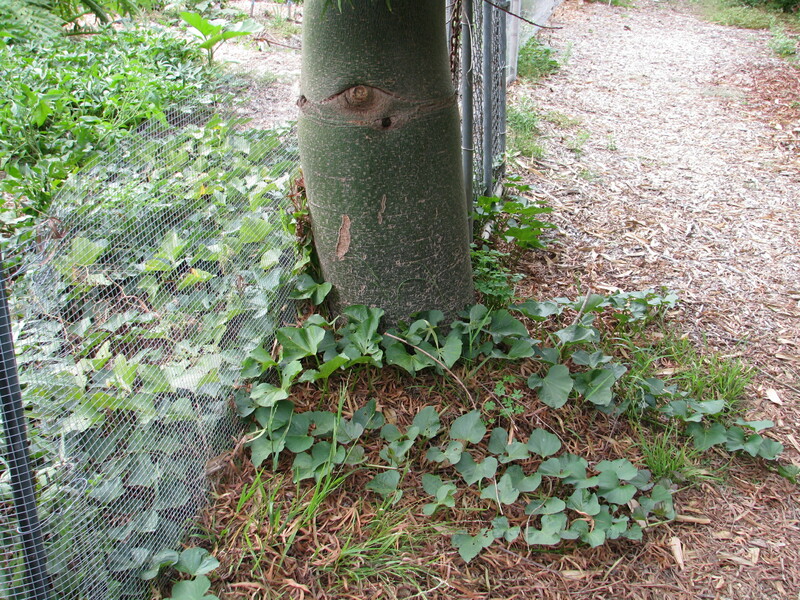 A volunteer kabocha squash vining its way through a bush. Our first ripeing macadamia harvest from a 3 year old tree, with a dragonfriuit snaking through. 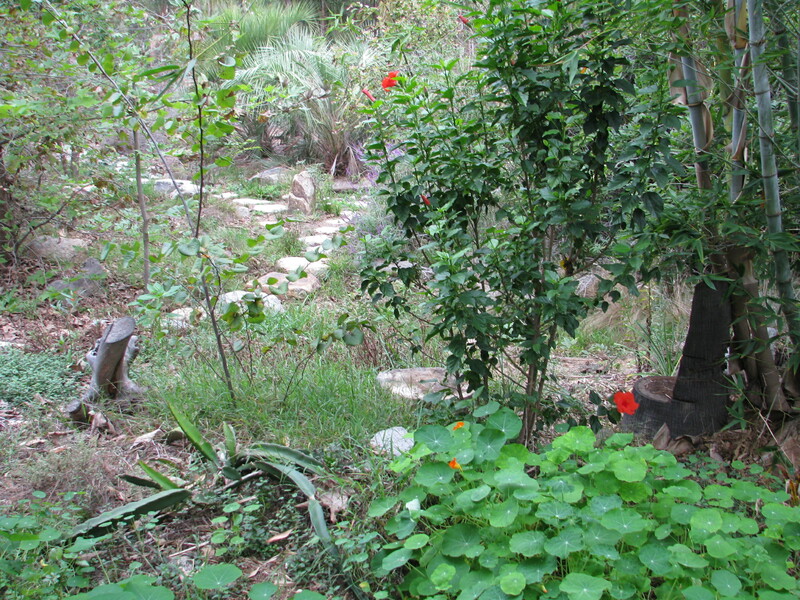 Edible hibiscus, volunteer nasturtiums and pathway across the rain catchment basin. Summer has lost her vicious grip and we have time until the holiday rush and winter cold. Finch Frolic Garden has withstood the heat, the dry, the inundations, the snow and the changes, all without chemicals or much human intervention. 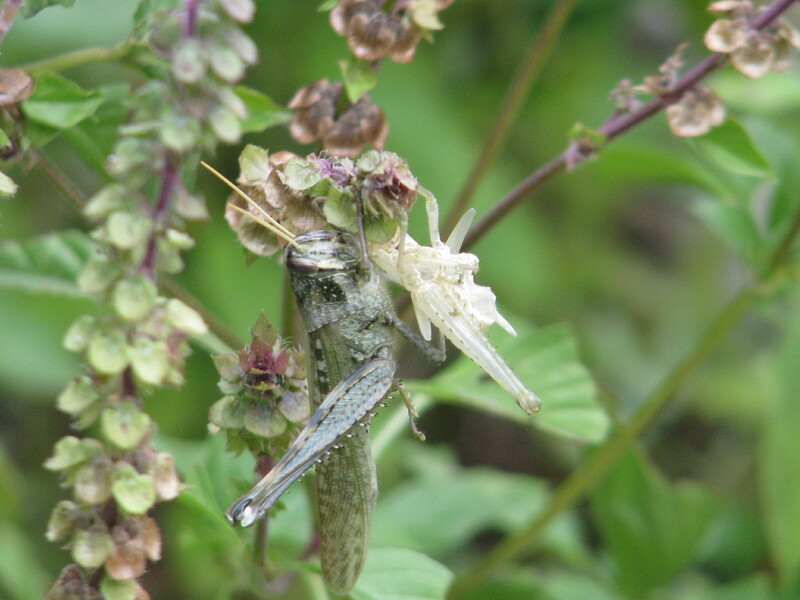 Grasshopper freshly out of last instar. We’ve lost some trees and shrubs this year, but that is mostly due to the faulty irrigation system which delivers too much or too little, and is out of sight underground. Bulbs will pop up year round for wonderful surprises. 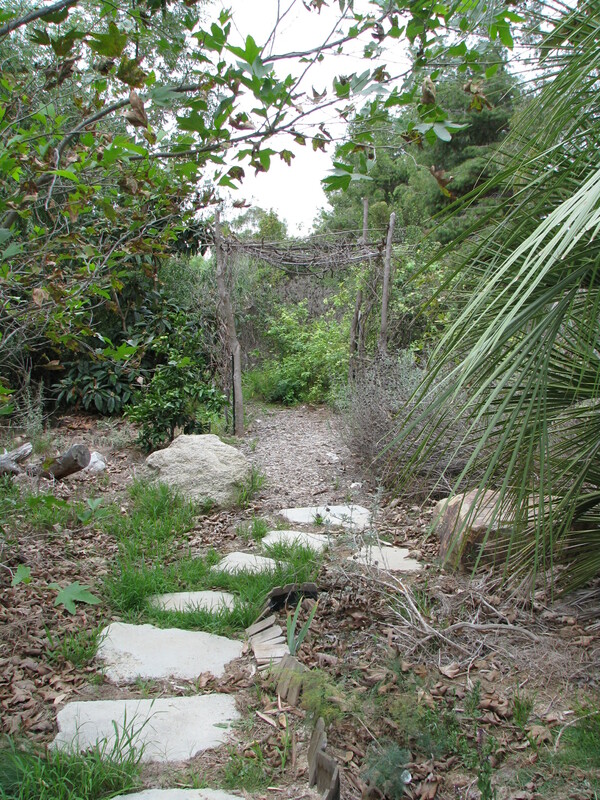 Permaculture methods in sheet mulching, plant guilds, swales, rain catchment basins, and the use of canopy have pulled this garden through. 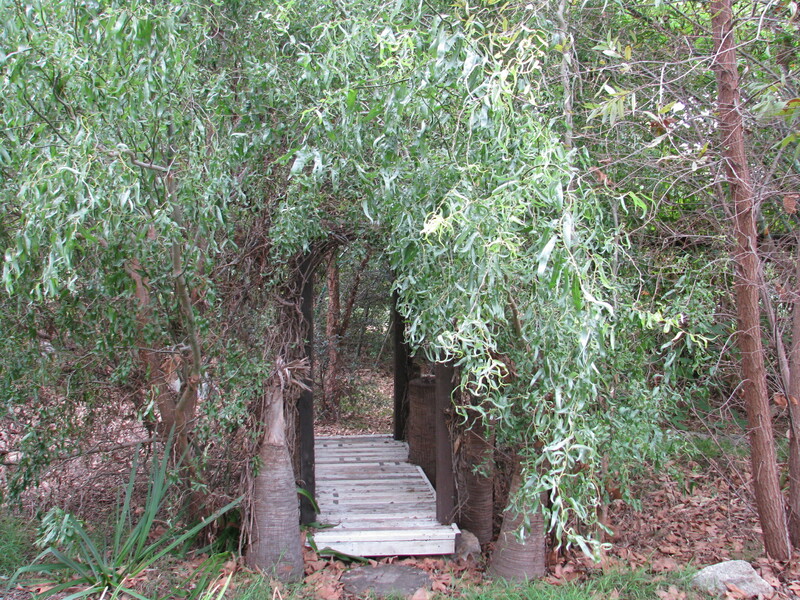 Bridge over currently dry streambed. A gourd in a liquidamber. The birds, butterflies and other insects and reptiles are out in full force enjoying a safety zone. A few days ago on an overcast morning, Miranda identified birds that were around us: nuthatches, crows, song sparrows, a Lincoln sparrow, spotted towhees, California towhees, a kingfisher, a pair of mallards, a raven, white crowned sparrows, a thrush, lesser goldfinches, house finches, waxwings, robin, scrub jays, mockingbird, house wren, yellow rumped warbler, ruby crowned kinglet, and more that I can’t remember or didn’t see. 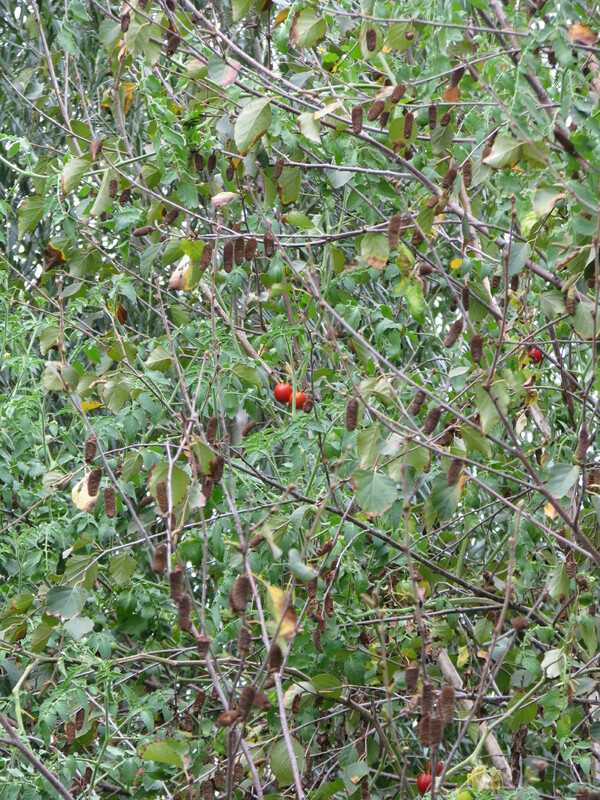 …a volunteer cherry tomato that is fruiting inconveniently ten feet up. Birds have identified our property as a migratory safe zone. No poisons, no traps. Clean chemical-free pond water to drink. Safety. 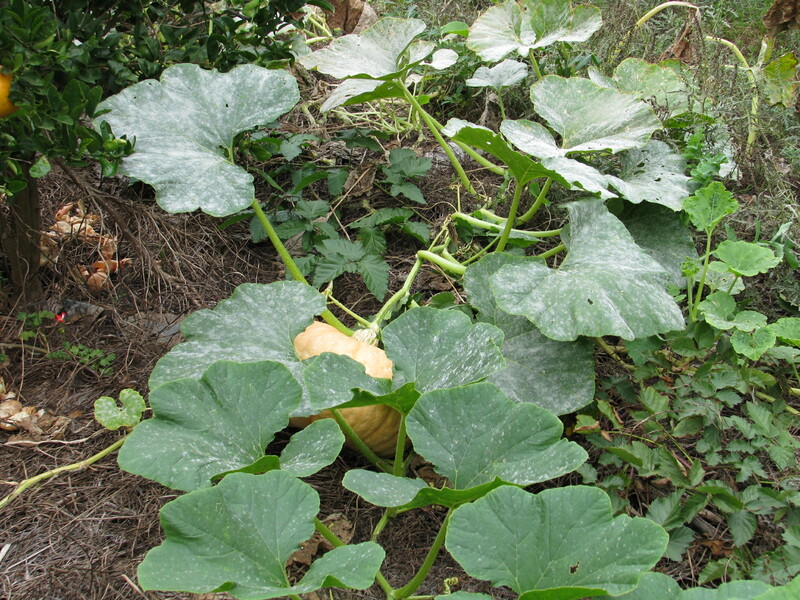 Squash and gourds happily growing out of the hugelkultur mound. 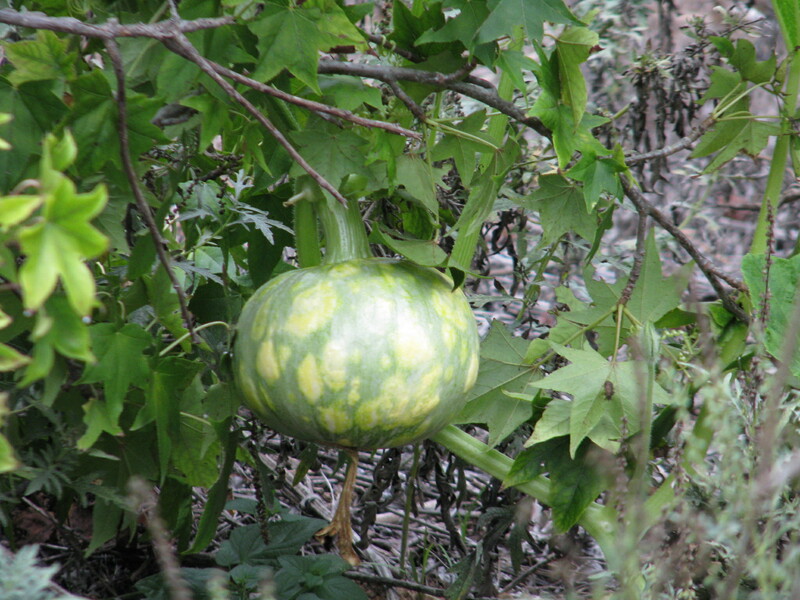 A surprise pumpkin hiding in the foliage. 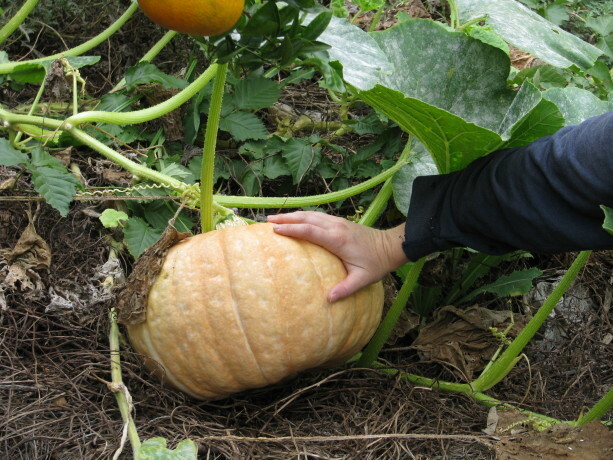 A huge and lovely gourd. Vines taking advantage of vertical spaces by going up the trees. You can provide this, too, even in just a portion of your property. 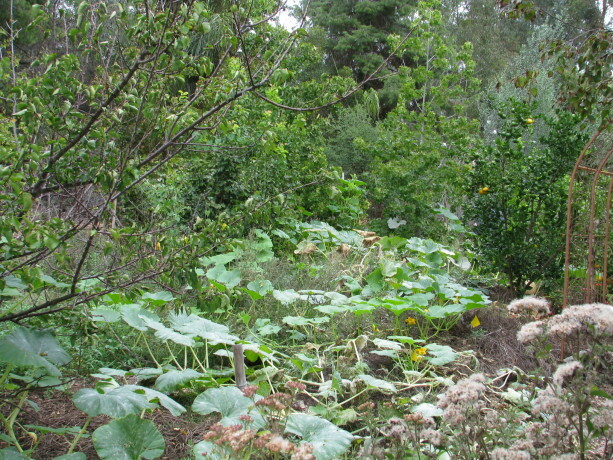 The permaculture Zone 5. Why did the gourd cross the road? To climb up a liquidamber, apparently. 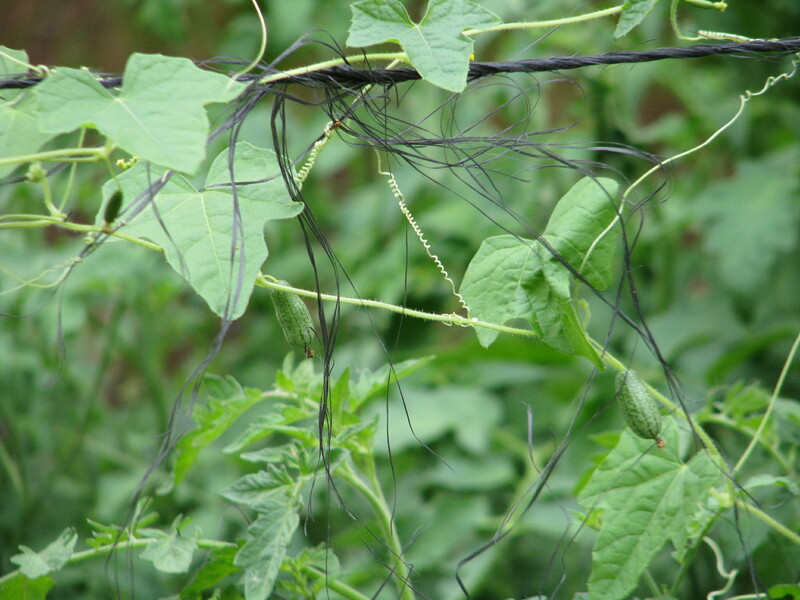 Mouse melons on a tiny vine. More cucumber than melon, they grow to be olive-sized. Time for me to get in the water and trim back the waterlilies before the water temperature drops! 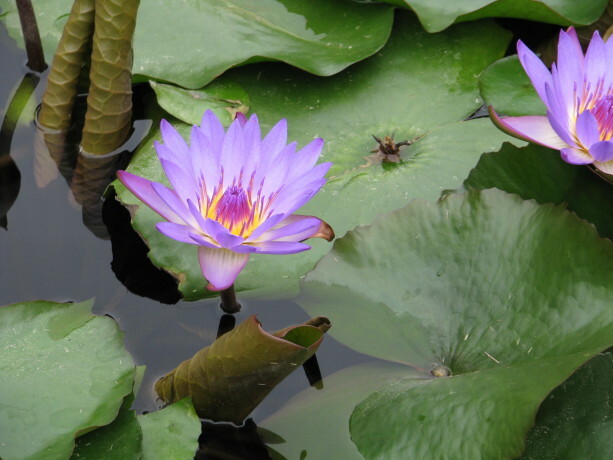 Purple water lilies in the pond. I’m indulging in showing you photos from that overcast October morning, and I hope that you enjoy them. Sweet potato vines escaping the veggie garden; the leaves are edible. See the long tan thing on the trunk? That’s a zucchino rampicante, an Italian zucchini. Eat it green, or leave it to become a huge winter squash. Violetta artichokes regrowing in our veggie garden, with a late eggplant coming up through sweet potato vines. Any vertical space – wire, nets, roofs, trellises – will catch water and allow it to drip. Today, despite being April Fool’s Day, our California governor finally recognized our severe drought and ordered mandatory cutbacks. That is a whole other can of worms due to the corporations and large businesses which are using so much water, and I won’t get into it. However, much of the world is becoming a drier place, and it is happening quickly. How does that relate to permaculture? 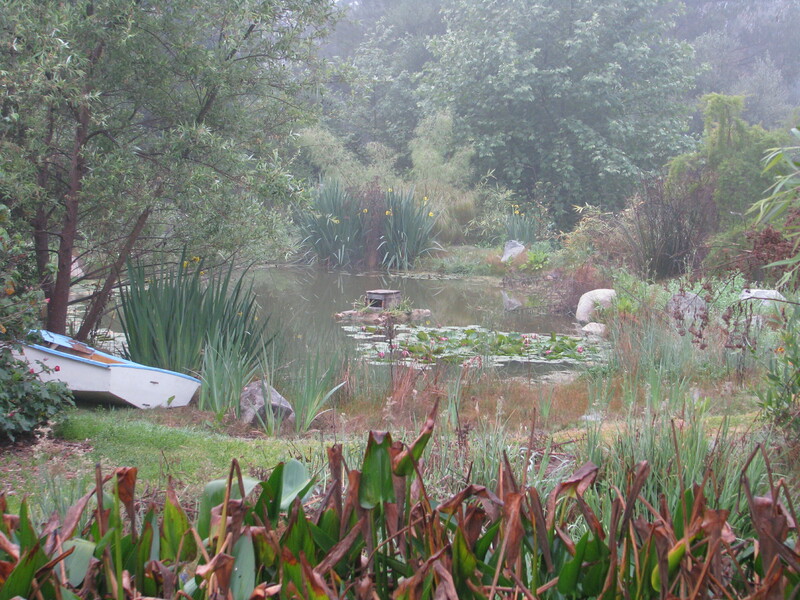 Heavy mist over the pond. 1. The best place to hold rainwater in in your soil. For that you need to dig simple or extensive swales (ditches with level bottoms), rain catchment ponds (holes like dry ponds) and even small fishscale swales above each plant. Catch water as high up on your property as you can, in the areas where water will naturally flow into. Holes, dry ponds and swales all passify the running water and allow it to sink into the soil rather than running off the top. Even if you have flat property, texturing your soil will allow water to percolate more quickly. Driveways, roads, sidewalks and paved pathways – called hardscape – all channel water. 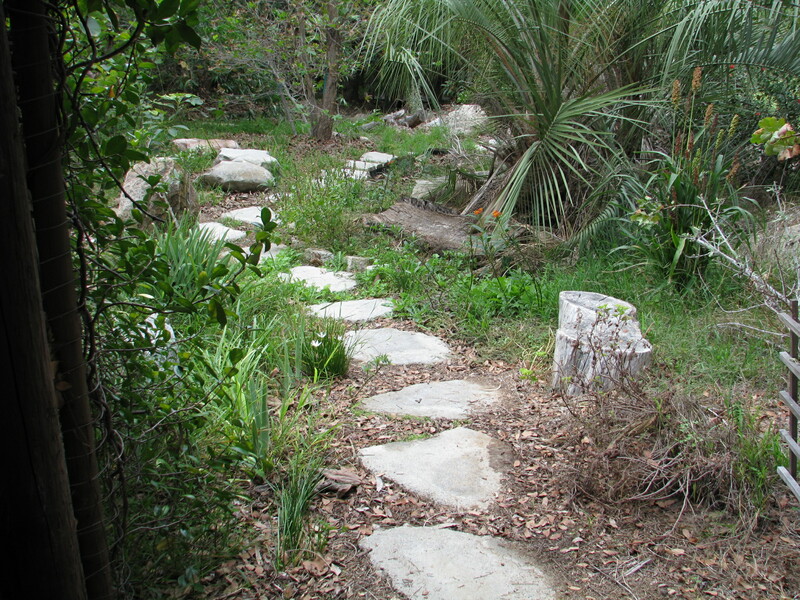 See where the water flows and catch it, or redirect it into swales where you want the water to go. The taller the tree, the higher the precipitation it can harvest. 2. Heavy clay soil will percolate slowly and water can puddle up and even become anaerobic. Sandy soil will allow the water to drain very quickly. What you want is for the soil to hold the water for as long as possible without becoming anaerobic so that trees and plants can use it for months after it stops raining. The solution to both of these soils is to bury organic matter. Hugelkultur is the term used for layering dirt on wood or other organic matter. Old logs are perfect. Any clippings, old cotton bedding, clothing, pillows, branches, leaves, junk mail… anything that can be considered ‘brown’ (as opposed to ‘green’) waste, will work. Don’t heap debris in a hole and cover it up. Layer it with dirt and cover it over with mulch. Plant on your hugelbeds. Make your holes or beds perpendicular to water flow so that water hits them and infiltrates the mounds. The organic matter will become a sponge and hold that water in the dirt. As the topsoil dries out it will wick the moisture from the buried organic material. Meanwhile just by burying or stacking the organic material you will have made nutrient and oxygen channels available to roots, and as the wood decays it feeds the microbes and thus the plants. You are improving your soil for years to come, feeding your plants, catching and holding rainwater in your soil, recycling, and sequestering carbon that would otherwise be released into the atmosphere from the exposed dead wood. How great is that? You don’t have to use trees… if the labor isn’t for you then use a trowel and a piece of old untreated 2×4, nails and all, and make a fishscale swale and hugel above each plant. Also, fill your raised beds and pots half-way with layered wood and dirt, and you will be saving water and fertilizing your plants as well. Have established trees? Use a hose and a power nozzle (or just a sledge hammer if the ground is soft!) to drill holes vertically around the dripline and hammerwood down into the ground. You won’t be cutting through roots. 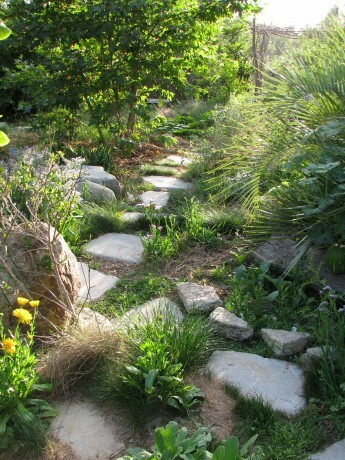 Turn your alleys and foot paths into hugelswales by digging them down, laying a layer of wood, covering the wood over with dirt allowing the path to have a slightly concave shape that is level at the bottom. You can walk on it, it will catch and hold water that gravity will feed down to plants below rather than puddling up. Every time you plant, except for when planting desert plants, put old wood at the bottom of the planting hole. Soaking wood in actively aerated compost tea or worm casting tea first will really kick off the microbial activity. No wood? Cruise the neighborhood at trash day and see what is out there. Tunnel spider webs show how much moisture is dropping on this hugelbed. 3. Cover your ground with mulch. Sheet mulch under your trees and along your pathways to lock in moisture and prevent rainfall from compacting your soil. It is always good to leave some bare ground – particularly by wet areas – bare for some insects to lay their eggs in. If you have bugs, then you have lizards, frogs and birds which will eat your problem insects (unless, of course, you have outdoor cats. They will kill all of your predators. Keep your cats confined!). If you don’t have bugs, you don’t have predators. Then when the bad bugs move in there won’t be anything to eat them. 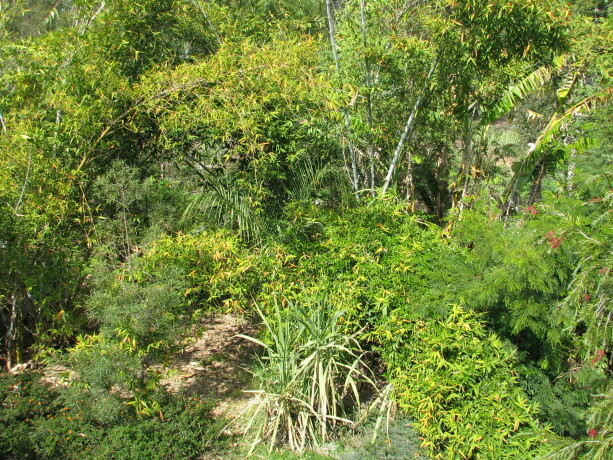 Dense bushes hold the moisture in. It sounded as if it was raining during this light fog. 4. Plant a lot. That may sound opposite of what to do in a drought, but you need to plant drought tolerant canopy trees and bushes that will spread. Although we may not receive rainfall we will be receiving dew, mist and fog, and the more surfaces you have to catch it, the more water your yard will receive. 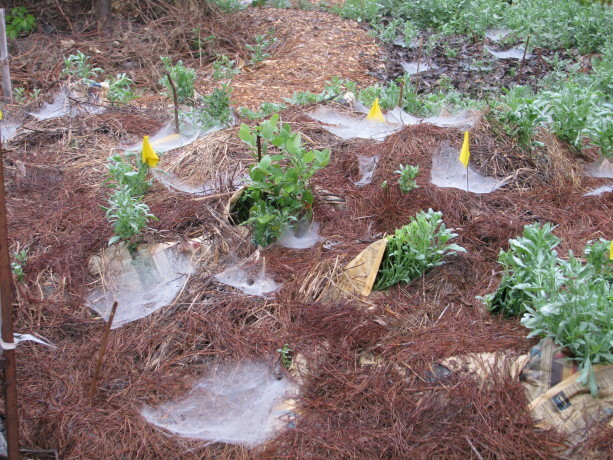 Mist nets won’t work in Southern California very well because we don’t have a lot of heavy fog. However trees are made to catch water and gently deliver it to their leaf-covered roots. 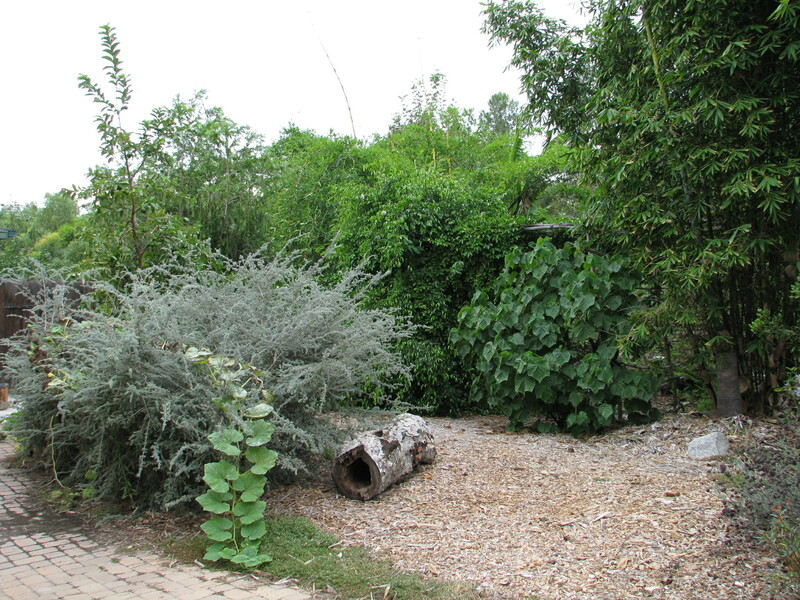 Shrubs are groundcover that produce leaf mulch and habitat for birds and lizards. They keep the moisture from being blown away during our Santa Anas. Trees are wind breaks which protect other trees and plants. Plant fast-growing drought tolerant trees on hugelbeds that are there to work for you: they passify the wind and catch precipitation, while dropping leaves for mulch and turning your dirt into soil. 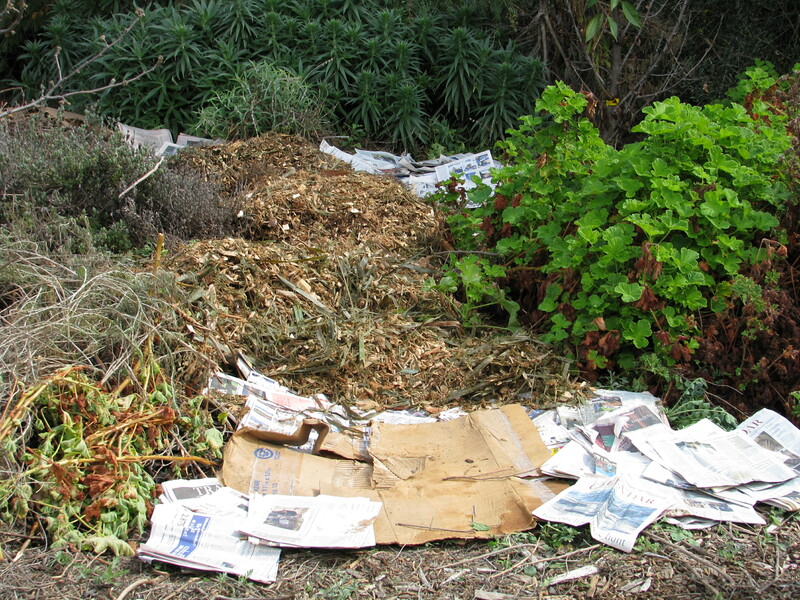 A 1/2 inch of cardboard or newspaper with mulch on top. PLEASE, do NOT spread gravel or small rock! All those little stones – which are virtually impossible to remove from your landscaping – are all thermal masses. They bake your soil, increase the temperature of your garden and reflect heat up onto your house and the underside of the leaves of whatever you may have planted. Gravel and stonescapes cook the planet because there are so many edges to heat up. With gravel yards there is nothing to allow water to percolate into the soil, there is no height to catch rain or passify winds. Stonescapes reflect light and heat back up into the air further drying the atmosphere, called the albeido effect..
How do you reduce your domestic water use? Cut in in half by flushing the toilet every other time (or less). See how fast you can take a shower. Fill a glass with water every morning and use only its contents to rinse your toothbrush or your mouth during the day (if there is any left, drink it or pour it into the back of your toilet tank). Use a pan of water to wash dishes instead of running water. Irrigate only when it is dark, after 3 am. That allows the least evaporation with the least insect problems. Don’t use overhead irrigation. If you are on a well, don’t think that you have an unlimited supply of water – don’t spray water around pastures at noon. Water is precious and needs to be cherished. See how many uses you can get out of water that you buy – wash water can go into the toilet or onto plants. Investigate greywater. Use your laundry water right into your landscape (use safe soaps). Get as many uses out of your clothes before you wash them. Look at your monthly water usage on your bill and challenge your family to reduce it by half, with a family reward (movie? Local restaurant?) when you succeed. Saving water can be done. It MUST be done. We are used to water security and now we have to change our ways, while the changing is still easy. 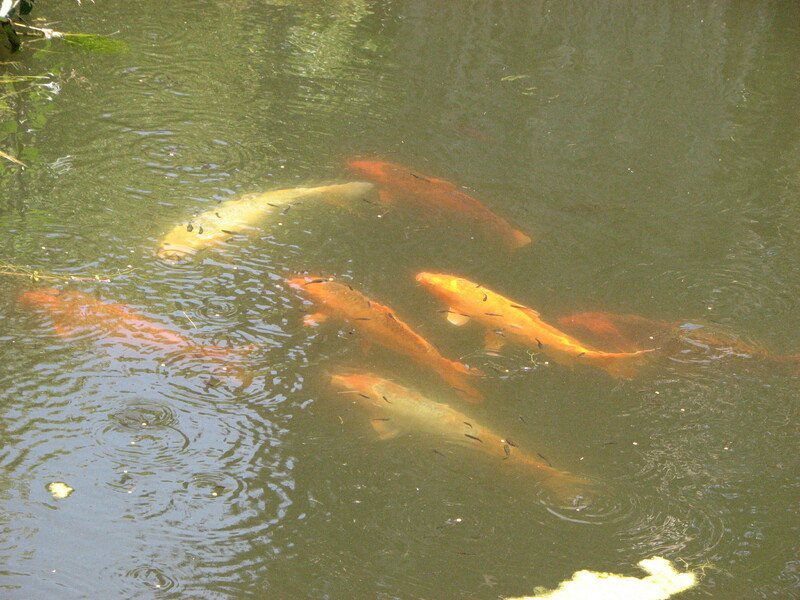 The ponds at Finch Frolic Garden are cleaned by fish and plants, with no chemicals, algaecide, artificial aeration or filtration. Well-balanced water allows wildlife to thrive. I should have more accurately called this post, Saving All the Insects, or even Saving the Wildlife, because the answer to saving one is the answer to saving them all. We’ve been inundated for years – my whole lifetime, in fact, – with pleas to save our environment, stop whale slaughter, stop polluting, etc. I remember winning a poster contest in fifth grade on the subject of curtailing littering. Since Rachel Carson’s books woke people up to the hazards of DDT and how chemicals have many deadly side effects there has been a grassroots effort to stop the pollution. Since Al Gore’s An Inconvenient Truth came out the push for environmentally friendly lights, cars, LEED-certified buildings and many more positive anti-climate-change actions have grown furiously. Too bad no one listened to him decades before. A drop in the economy and the radical change in weather patterns have people exploring organics, making their own clothes and foods, changing their shopping habits and thinking about what they are bringing into their homes. However, this week the World Wildlife Fund released the staggering results of a study that states that between the years 1970 and 2010, 52% of the world’s animal populations are gone. Over half. Gone. On our watch. In my lifetime. I am stunned with shame. So what about the next 40 years? Over 97% of California wetlands are already gone. There are only 3% left in Los Angeles. 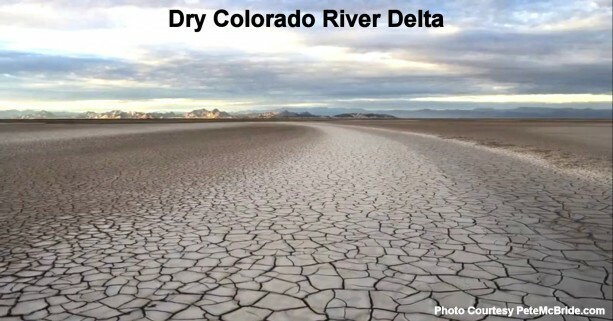 The Colorado River hasn’t met the ocean for decades, except briefly last year due to major earthworks. We are pumping all that water overland, open to the sun for evaporation, to treatment plants that fill it with chlorine and other chemicals, then sell it to us to spray over lawns and flush down the toilet or let run down the drain while the water heats up. It is madness. All the wildlife that depended upon the Colorado River along that stretch are gone. All the insects, the frogs, lizards, birds, mammals, etc. that need a clean drink of water no longer have access to it. The only water they can drink is usually chlorinated domestic water in ponds and bird baths. Too often this water is treated with algaecide, which claims it doesn’t hurt frogs but it does kill what the frogs feed upon. We are killing our animals with poisoned domestic water. One of the largest reasons we have extinctions in North America is mismanagement of rainwater in drylands (other than polluting the waters. Poaching, over-fishing, destruction of habitat and climate change are the main reasons). We have cleared and flattened the ground, and channel rainwater off into the ocean. Look around at your streets and houses. Are they harvesting water or channeling it? Any property that is slanted is channeling water away. 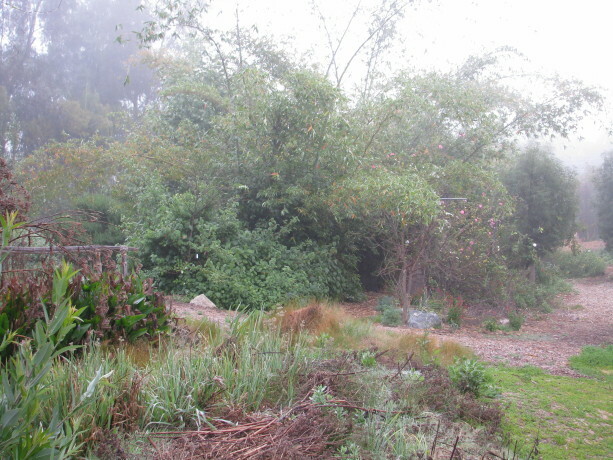 Any property that is level – like the bottom of swales – is harvesting water. So many properties are inundated with annual rains because there is no water harvesting above them. When you harvest water, it runs into rain catchment basins and swales instead of roaring down the hillside taking all the topsoil with it. Water becomes passive and percolates down deeply into the soil. That deep saturation draws tree roots down into the ground. The roots break up hardpan, make oxygen and nutrient channels into the dirt and produce exudates (sugars, carbohydrates and starches) through their roots to attract and feed the billions of microbes that turn your dirt into rain-holding soil. That underground plume of rainwater then slowly passes through your soil, re-enervating subterranean waterways, refilling your wells and bringing long-dry streambeds back to life. We must harvest rainwater to save our animals and plants, and consequently ourselves. We must reestablish sources of clean, unpolluted chemical-free water for animals to eat and from which to drink. Healthy pond water is off-color due to tannins, and is filled with tiny creatures. Some such as daphnia are visible, but just like soil microbes, many aquatic creatures are microscopic. Fish and frogs feast from this level of the food chain, and these creatures make the water balanced. They eat mosquito eggs. They clean up algae. They are as vitally important as soil microbes. Oh, and 83% of the frogs are gone. I spoke with Quentin Alexander from HiveSavers today; he performs humane bee rescue around the San Diego area and has been trying to re-queen Africanized hives with calmer European queens which will breed nicer behavior back into the bees rather than having to kill the entire hive. He has had no luck in the past two years with European queens, even those bred in California. With very little wetlands left, and those often sprayed with DEET by Vector Control, or polluted with chemical fertilizers and oils washed out of front yards, streets and driveways, these insects must resort to drinking from swimming pools and bird baths. Again, these contain highly chlorinated water. Animals are being forced to drink poison, or not drink at all. We MUST stop using chemicals on our properties, and we MUST harvest rainwater. We MUST stop spraying well water into the air but irrigate with it in dripper form under mulch so that it is cycled back into the ground rather than evaporated. One inch of rain on one acre in one hour is 27,154 gallons of water! It is so easy to harvest rainwater – dig level-bottomed swales! Dig small ones with a trowel. Fire up the tractor and turn road ways into swales, or cross-cut vertical paths with swales that have dedicated overflows. Dig rain catchment basins to catch a flow of water. Catch water as high up on your property as you can. If you have level soil, fantastic! You have it so easy! Make gentle swales, rain gardens, rain catchment areas and sunken gardens to catch and percolate the water. Bury old wood perpendicular to water flow – its called hugelkultur. Please watch this six-minute video by Geoff Lawton of the Permaculture Design Institute of Australia. You need to type in your name and email, but they don’t sell your information nor do they bug you with lots of emails. Here is the link. The title is Finding An Oasis in the American Desert, and it is about the Roosevelt swales dug during the dust bowl in the desert. If nothing that I say, nor anyone else says can convince you, then please watch this and see the effectiveness of rain harvesting. We MUST do this, and now before the rains come is the time. Catch all the water that falls on your property in the soil, and try to catch the water that runs into it. If there are flood waters channeled through your property, see if you can talk to the people who own land above you about harvesting water up there. It will reduce the flooding, save topsoil and benefit everyone’s property. Work towards keeping rainwater in your soil, reducing your domestic water, and making what streambeds are left come back to life. Keep our old trees from dying by watering deeply through rain catchment. If you have a pond or swimming pool and treat it with harsh chemicals and algaecides, seek out a natural pond professional. In the San Diego – Los Angeles region there is Bob Lloyd of PuraVida Aquatics, or Jacob Hatch of Hatch Aquatics. Jacob builds natural ponds and maintains large natural waterways. 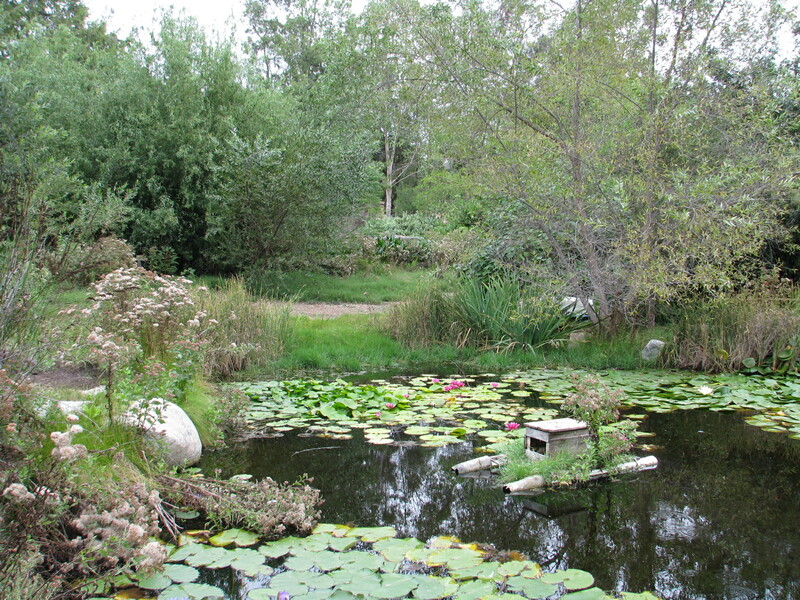 Bob maintains chemical-free backyard and display ponds that are full of wildlife. He can convert your pool into a clean swimming pond where the water is filtered by plants and thus is lovely year-round, provides abundant habitat and doesn’t need chemical treatments. No chlorine to burn your skin and eyes. How great is that? He can also create a constructed wetland that cleans your greywater with plants. 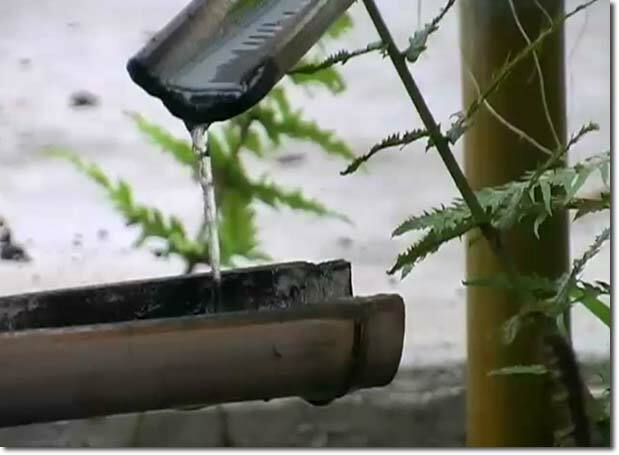 There are so many simple and inexpensive ways to harvest rainwater rather than allow it to flow into the salty ocean without penetrating the soil. Please, please, please do them, and if you already have THANK YOU and gently encourage your neighbors to do the same. We must stop the habitat destruction and start to rebuild what is gone. Come take a tour of a food forest! Permaculture Lectures in the Garden! 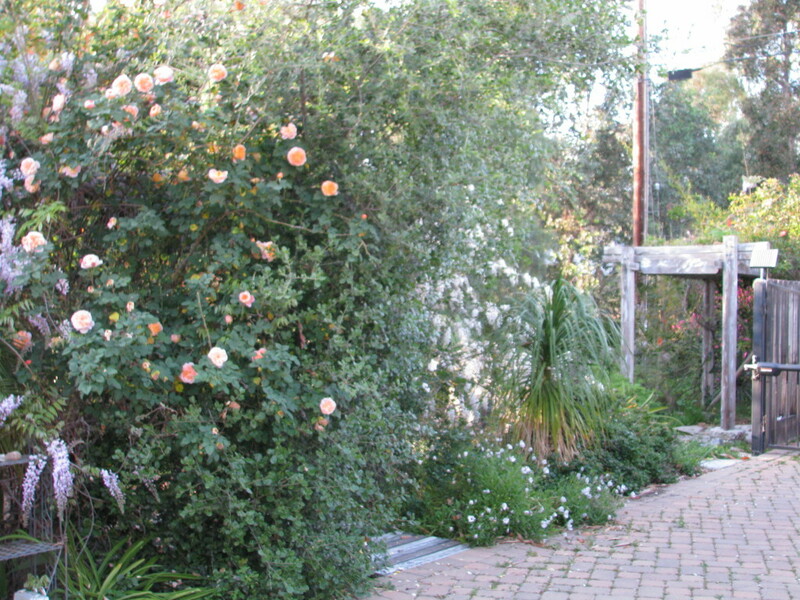 Saturday, June 7: Introduction to Permaculture and Finch Frolic Tour: We’ll take you through the main precepts of permaculture and how it can be applied not only to your garden, but to yourself and your community. 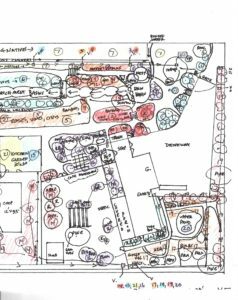 Then we’ll tour Finch Frolic Garden and show rain catchments, swales, plant guilds, polyculture, living buildings and so much more. 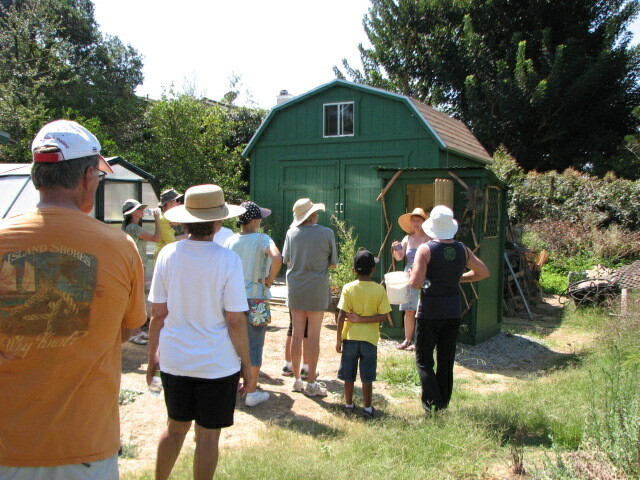 Saturday, June 14: Your Workers in the Soil and Earthworks: Learn the best methods for storing water in the soil and how to replace all your chemicals with actively aerated compost tea and compost. Saturday, June 21: Aquaculture: You can have a natural pond – even in a tub! 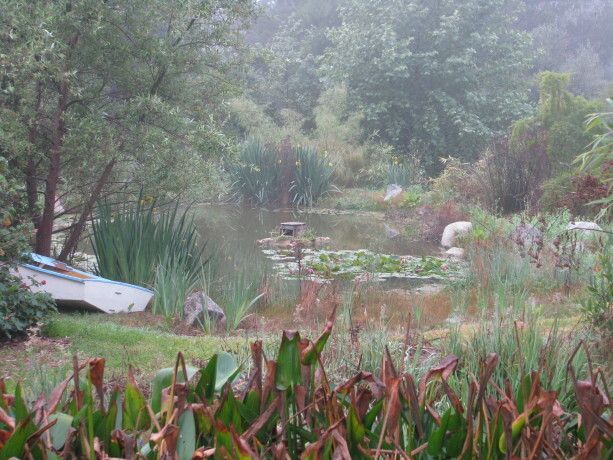 How natural ponds work, which plants clean water and which are good to eat. Even if you don’t want a pond, you’ll learn exciting information about bioremediation and riparian habitat. Saturday, June 28: Wildlife in your Garden: What are all those bugs and critters and what they are doing in your yard? We’ll discuss how to live with wildlife and the best ways to attract beneficial species. Jacob Hatch Owner of Hatch Aquatics. 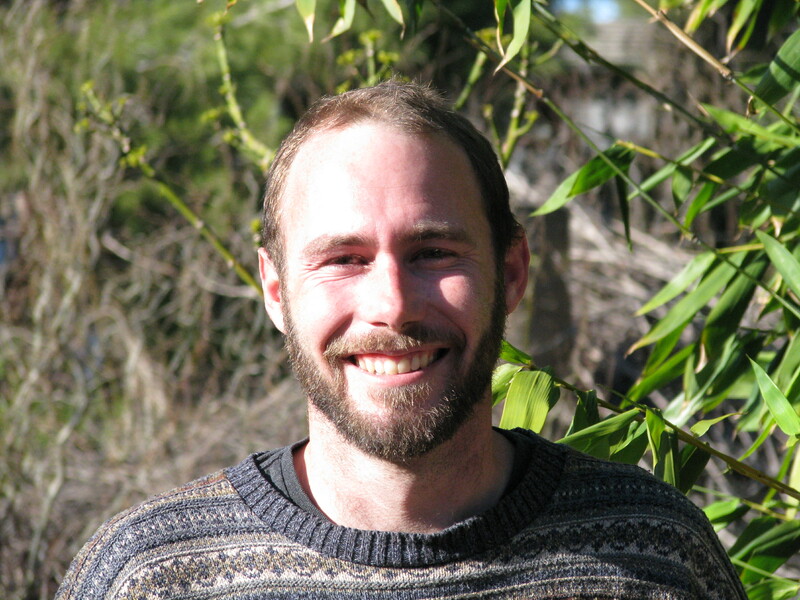 With years of installing and maintaining natural ponds and waterways, and a Permaculture Design Course graduate, Jacob has installed earthworks with some of the biggest names in permaculture. Miranda Kennedy OSU graduate of Wildlife Conservation and wildlife consultant, Miranda photographs and identifies flora and fauna and maps their roles in backyard ecosystems. Diane Kennedy Owner of Finch Frolic Garden, lecturer, consultant, Permaculture Design Course graduate, former SDC Senior Park Ranger, Diane educates homeowners on how to save money and the environment while building their dream gardens. Each class limit is 50 attendees, so please make pre-paid reservations soon before they fill up. Fee for set of four lectures and tour is $45 per person. Single session fee is $20 per person. Contact Diane Kennedy at dianeckennedy@prodigy.net for reservations and directions. You will not want to miss this fascinating and useful information!